Mohamadou Idrissou is one of the five players to be dropped from Cameroon's final squad for the World Cup. The 34-year-old Kaiserslautern striker has struggled in recent times and missed a penalty in a 2-1 friendly loss to Paraguay last week. Otherwise coach Volker Finke has opted for a tried and trusted line-up for his World Cup squad. Coton Sport duo Loic Feidjou and Cedric Djeugoue are the only two locally based players on the 23-man list. Djeugoue sealed his place on the plane to Brazil with an impressive display in the Indomitable Lions' 2-2 draw with Germany on Sunday. The other players to miss out are goalkeeper Guy Roland Ndy Assembe, midfielder Cedro Loe and defenders Jean-Armel Kana-Biyik and Gaetang Bong. Kana-Biyik has been struggling with a thigh injury throughout the last two weeks of preparations in Austria and now will not be able to emulate his father Andre, who played at the 1990 and 1994 finals. His uncle Francois Omam-Biyik scored the opening goal of the 1990 World Cup in Italy in Cameroon's upset triumph over defending champions Argentina, a match in which Andre was sent off. Much will be expected of forward Vincent Aboubakar after his 16 goals for Lorient last season. That made him joint-second highest scorer in the French Ligue 1 behind only Zlatan Ibrahimovic. He is set to partner elder statesman Samuel Eto'o, who remains Cameroon's all-time leading scorer with 55 goals. 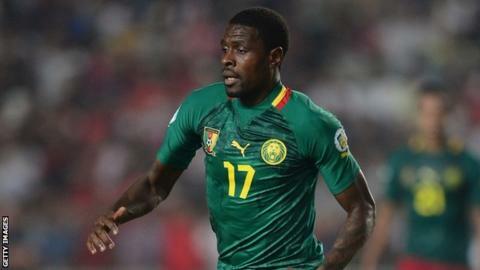 Cameroon are the most successful African team at the World Cup, qualifying for the tournament seven times and in Italy in 1990 they became the first team from the continent to reach the quarter-finals. In Brazil they will face the hosts, Croatia and Mexico in Group A.